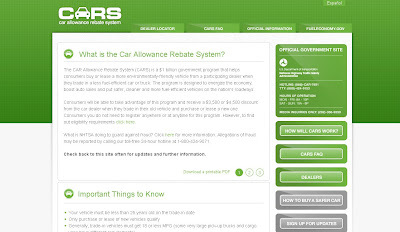 Cars.gov is the website for the so-called "cash for clunkers" program that urges owners of gas guzzlers to trade in their cars for new models with better mileage. Yet the site's pitch for monetary incentives that can top four thousand dollars doesn't draw on the persuasive appeals of a standard government website. First off, the visual rhetoric does little to call up the conventional red, white, and blue associated with the patriotic colors of a government website. Second, although the type indicates that the user has arrived at an "official government site," the cascading style sheets chosen look more like the template for a small business. Fueleconomy.gov also little resembles a noncommercial site, despite its government domain status. 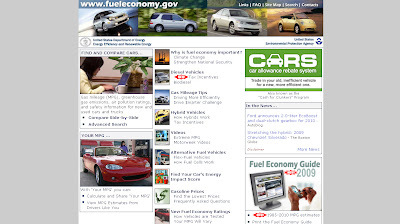 Note the prominent placement of stock photographs of the glossy exteriors of brand-name cars rather than the MPG charts and other information design strategies for comparison that conservation-minded consumers might expect.